Workplace Insanity: No Job Is Hard For The Person Who Doesn't Have To Do It! No Job Is Hard For The Person Who Doesn't Have To Do It! Do you remember, as I do, watching Star Trek: The Next Generation? 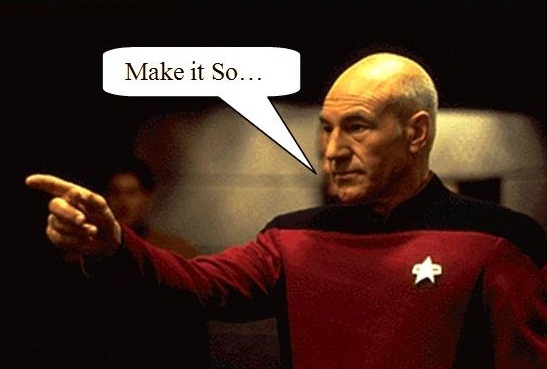 In almost every episode Captain Jean-Luc Picard would encounter a horrific crisis, would seek some input and advice from his command crew regarding a virtually impossible solution, and then turn to his engineering staff or others and say, “Make it so!”, as if his simply saying this could make it happen, and of course it goes without saying, they are to “Make it so!” within an incredibly short timeframe (by the end of the episode). But no job is hard for the person who doesn’t have to do it! It then falls on the engineers or others to try to make sense of the often ridiculous demands, impossible requirements, or unattainable timeframes and to try to turn the Captain’s “commands” into realities. How often do you see similar situations occurring in the workplace? A person with no concept of what’s involved comes in and demands that a complex job be done within an impossible timeframe. That person then leaves the room, and subsequently yells and screams when things don’t happen as he/she imagines them. When you try to inject some reality into the situation, to explain the technical difficulties with his/her demands, or the time it will actually take to accomplish what is requested, this person does not want to hear it. The demand has been set, and it is your task to “Make it so!” It’s easy for them to say, but often darn near impossible for mere mortals who actually have to do the work. This has always been a pet peeve. Such an imperious approach can actually be good if the stated intent is to set a new direction with stretch goals, and the timeframes are even somewhat reasonable. For example, John F. Kennedy set a goal in 1961 of landing a man on the moon and returning him safely to earth by the end of that decade. This was certainly a stretch goal, but one which had a chance of reality and one which motivated people to excel and accomplish a difficult but achievable goal. If he had said this was to go to Mars and back, or to be done by 1962, it would have been recognized as totally impossible, and would have been de-motivating rather than motivating. The difference is in the intent and in the attainability of the goals. When rationality prevails, and the people involved recognize the realities involved, an aggressive yet attainable project can be defined to develop and deliver the needed product (see Failing to Plan Means You Are Planning to Fail!). Meaningful product requirements can be defined that delineate a substantial product that meets corporate goals (see Development Methodology: Requirements). A strong team can be assembled that will buy in to the development goals and the timeframes desired (see Do Jobs Right – Assign the Right People!). It can be nothing short of astounding to see what such a committed team can do when given aggressive yet rational goals (see Pigasus: When Pigs Fly!). So, what do you do when you see that irrationality is likely to prevail? First, do not accept the inevitability of irrationality. It is up to every person involved to stand up to this and defend a rational point of view. Make sure the irrational proponent understands that an impossible goal will lead to project failure, a prospect that none involved want to happen, and that laws of physics cannot be overturned simply because this proponent would like to do so. Ask the irrational proponent how he/she believes impossible requirements can be met, or how unattainable timeframes can be reached, or how unavailable resources can be applied. Let him/her know that a command of “Make it so!” just doesn’t cut it. Explain the realities – slowly, calmly, logically, and repeatedly (see Pound The Facts, Not The Table). Ask the irrational proponent to address each of these realities with alternative solutions or approaches. Explain the alternative as you see them. If the irrational proponent presents some good alternatives, embrace them, rethink the impact, and continue with the discussion, taking each point one at a time, and walking through all of the issues. If the proponent can convince the people involved that he/she does have a way to achieve the goals, then you have all reached an agreement and buy-in, which is, after all, what you really want in order to succeed. If this proponent cannot, then help make it clear what the implications are, and what the options are: to trim back on features, add time to the schedule, add to or modify the resources to be applied, or whatever else can be done. If you can’t get to the point where a rational discussion can even begin, then agree to disagree, and raise the issue to someone higher in the management chain who is more open to reason. You may ultimately paint yourself into a corner where you are viewed as the one who is being irrational. But are you really worse off then than by accepting a project you see as doomed to fail? Remember, you and your team are the people who will be tasked with carrying out the project, not the irrational proponent. You are the ones who will put your blood, sweat, and tears into making it happen. If it fails, you and your team will be the people held responsible. The irrational proponent can then insist that it’s entirely your fault, and that none of the blame should fall on him/her, because if you could have simply done as he/she said, the project would have been a great success that would have generated untold amounts of revenue for the company; what’s wrong with you! No job is hard for the person who doesn’t have to do it! Don’t allow yourself to be forced into an irrational situation.